Standard ping is useful for testing if a device is reachable through the network. However, it is not suitable for determining the quality or reliability of the network connection. Consider a network connection with 0.5% packet loss, which is quite high. It may take hundreds of pings to detect a lost packet. If we want to check network reliability with a sensitivity of 0.1% packet loss, we would need over a thousand pings. If we are to fine-tune or trouble-shoot a network, we would need to repeat these tests many times. Standard ping, at one ping per second, is way too slow for this purpose. What is important is the variation in round-trip time. If the round-trip time is sometimes fast and sometimes slow, we can deduce there may be network congestion or quality issues. To observe the variation, we would need to ping many times, and we also need a way to visualize the result. Universal Fast Ping can ping up to 100 times faster than standard ping by using overlapping pings. It keeps sending out ping packets without waiting for previous ping packets to come back. When the ping packets come back, it matches them with the outstanding pings to determine the round-trip time. This allows Universal Fast Ping to ping very fast even for connections with high round-trip time. With Universal Fast Ping, a thousand pings take only 10 seconds instead of 17 minutes. To visualize the large amount of data, Universal Fast Ping employs real-time charts with zooming support. 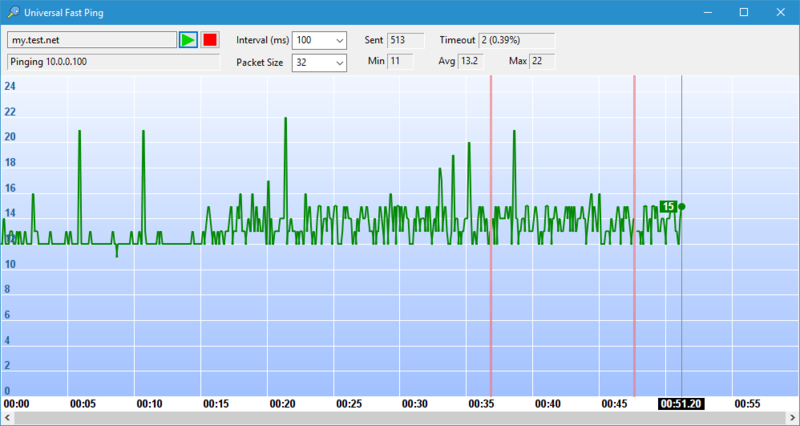 Round-trip times and lost packets are instantly plotted on the chart. You can zoom out to get an overview of the data, and zoom in to examine the details. With realtime charts, you can obtain instant feedback as you fine-tuning or trouble-shooting the network. For example, as you adjust Wi-Fi antennas, reposition of your Wifi connected notebook, or replug cables into different switches, you can immediately see their effects. Universal Fast Ping is an invaluable tool for anyone who needs to manage, optimize or trouble-shoot networks.